B'resheet/Genesis 49:10 The sceptre shall shall not depart from Judah nor the ruler's staff from between his feet until Shiloh comes and to him [shall be] the obedience of the peoples. Rashi, quoting the Talmudic Sages, says that Davidic authority over the people continued even after the destruction of the Second Temple by the Romans: "these are the exilarchs in Babylon, who rule with a sceptre, for they are appointed by royal authority" (b. Sanhedrin 5a). Baal HaTurim to translate the phrase as "nor a scholar from among his descendants", pointing out that the gematria of the phrase is equal to that of , Torah scholars. The word has caused problems for scholars ancient and modern, since it doesn't appear to be a sensible word in context. Rashi suggests that 'Shilo' is Messiah; he says, "This is the King, Messiah, for the kingship is his", but this is clearly based upon interpretation rather than language. The Baal HaTurim offers another piece of gematria: the phrase - Shiloh will come - is equal to that of the word , Messiah. Early texts from Qumran see Shiloh as a messianic title although there is no biblical text to support this. The Rashbam connects it to the ancient site Shilo in the territory of Ephraim, where the tabernacle rested during the days of the judges, suggesting that this is a reference to the splitting of the northern and southern kingdoms after Solomon's death: Judah's authority over the whole of Israel would last until the northern tribes split away from Rehoboam. The Ramban and the Radak treat the text as if the end letter hay were a vav, making a 3ms pronoun - 'him' - combined with the Hebrew/Aramaic word , "belonging to", to make a reference to a figure to whom the authority belongs. Targum Onkelos rewrites the entire verse, producing, "A ruler will never depart from the house of Judah, nor a teacher from his children's children forever - until the Messiah comes - for the kingdom is his and the nations will obey him." Drazin and Wagner, drawing on Tosafot1 to b. Yevamot 50a, suggest that the fact that this prophecy was not fulfilled should not be problematic since "the prophets did not prophesy what will be, but, rather, what should be", however disturbing such a sweeping get-out clause may seem. Perhaps the non-Yeshua-believing world is trying to be pragmatic in the face of their expectation of the restoration of Jewish sovereignty and the coming of Messiah and its apparent - from their point of view - and continued non-fulfillment. What, then, are we to make of the potential conflict between the plain (and difficult) meaning of this text and the widespread Christian belief that it is a direct prophecy of Yeshua? The first half of the verse is not a problem; the selection of the tribe of Judah as the ruling tribe in the nation Israel, pointing to David the king and to Yeshua as a descendant of David is quite safe. The issue is the meaning of the word 'Shiloh' and whether this is an explicit prophecy about Messiah. A number of English Bible translations (NIV, CJB) take one or other of the scholarly alternative translations - "until he comes to whom it belongs and the obedience of the nations is his" (NIV, CJB), "until tribute comes to him and the obedience of the peoples is his" (ESV, NRSV) - which allow the messianic interpretation to stand, but conceal the issues with the text. As long as we believe that a single verse can or should act as a proof-text for our faith or practice as followers of Yeshua, we are always going to be open to challenge. Our faith must be based on the overall balance of and dominant, repeated themes in the Bible - what the puritan divines used to call the "whole counsel of G-d". Peter wrote about the role of prophets and prophecy: "First of all, understand this: no prophecy of Scripture is to be interpreted by an individual on his own; for never has a prophecy come as a result of human willing - on the contrary, people moved by the Ruach HaKodesh spoke a message from G-d" (2 Peter 1:20-21, CJB). This tells us that no one individual is to interpret the prophecies of Scripture by himself. Brevard Childs explained that the Scriptures must be interpreted by the canonical faith grouping for whom they were written2. Yeshua had twelve close disciples and over five hundred witnesses of the resurrection. Those multiple witnesses provide slightly different eye-witness accounts (for example, the four gospels) that precisely because of their human variability and points of view assure us that they are genuine rather than being the stylised and perfectly matching accounts that you would expect where massive collusion or church-directed writing had occurred. Our studies in the Scriptures must be broad enough and deep enough to allow us to grasp an overview of all that G-d is saying, not just cherry-picking texts and verses that confirm our own pet theories. Our studies must also be in the context of a believing community who regularly study the whole compass of the Scriptures so bring balance and consistency to our own readings. It is not enough simply to skim the messianic prophecies and the psalms as our reading of the Hebrew Scriptures; neither is reading our favourite gospel and letters an adequate means of studying the Greek Scriptures. In both we must survey all the individual books and sections: The Torah, the Prophets and the Writings; the Gospels, Acts and the Letters as well as Revelation. 1. - Tosafot, literally 'additions', are mediaeval commentaries to the Talmud, now included as part of every printed copy. They were written by the tosafists, Jewish scholars in northern France and the German Rhineland, in the period 1075-1325. Application: Do you study the whole of the Scriptures or just your favourite parts? 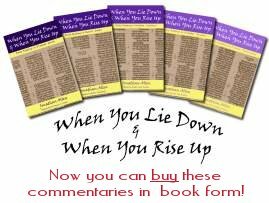 Perhaps now is the time to pick a book of a section that you haven't read before and start learning more about the G-d we serve! 06:03 14Dec13 Robert Williams: Thank you for your much appreciated comments and the application which I needed to hear.